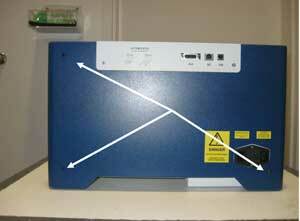 Loosen the captive screws shown in picture 1. 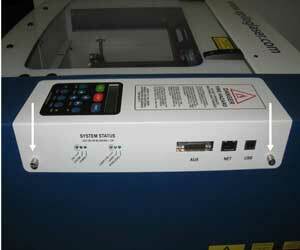 Remove the control/display assembly from the machine by grasping the captive screws and pulling the control board/display assembly toward you as shown in picture 2. Remove the three screws shown in picture 2a and the one screw shown in picture 2b. 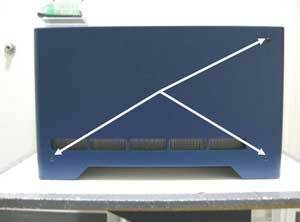 To remove the right hand side cover, lift up on the bottom of the cover and pull toward you as shown in picture 3, and lift up. Remove the three Phillips screws shown in picture 4. Remove the one Phillips screw shown in picture 5. 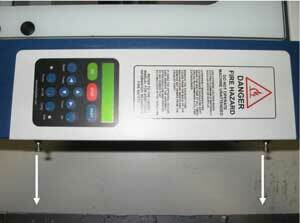 Move the x-axis assembly to the rear of the machine and move to the right hand side of the machine. 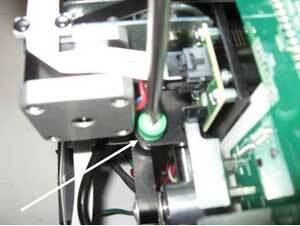 Loosen the green captive screw shown in picture 6. 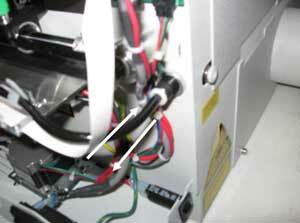 Remove the Phillips screw from the Air Assist tube shown in picture 7. 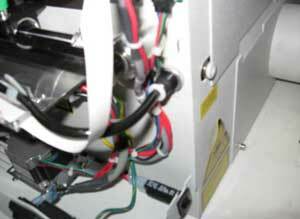 Remove the Air Assist tube by pressing in on the white ring and pulling on the black tubing as shown in picture 8. 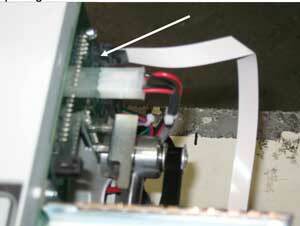 Remove the flex cable clamp by removing the two Phillips screws shown in picture 9. 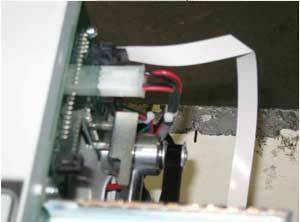 Remove the Flex cable, shown in picture 10, by pressing in on the cable lock and pulling the flex cable away from the PCB. 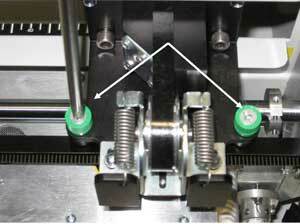 Move the X-axis assembly to the front of the machine and loosen the green captive screw shown in picture 11. 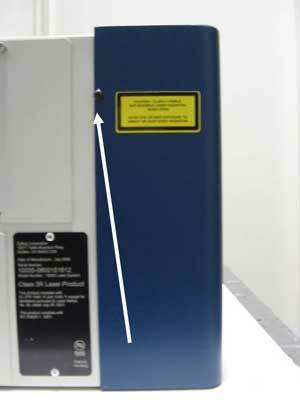 Move to the left side of the machine and loosen the two green captive screws shown in picture 12. The X-axis assembly is now held in place by guide pins. Lift up on each side of the x-axis to free it from the guide pins. 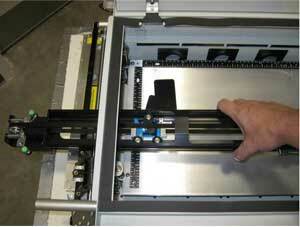 Gently remove the x-axis assembly through the opening in the left side of the machine as shown in picture 13. 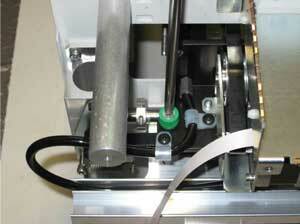 Be mindful of the flex cable and the Air assist tube as you remove the x-axis assembly from the machine. To reinstall the X-axis assembly, reverse the removal order. Begin by placing the X-axis assembly back on to the machine and setting it on the guide pins. Starting on the left hand side, loosely install the two green captive screws. 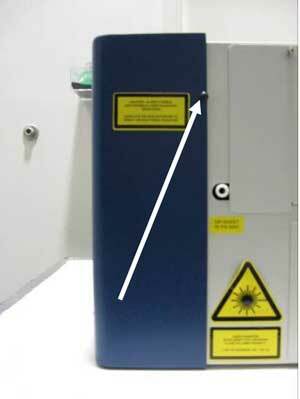 Move to the right hand side and loosely install the front green captive screw. 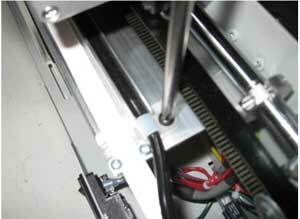 Move the rail to the rear and loosely install the remaining green captive screw on the x-axis assembly. Once all four green captive screws have been installed loosely and the rail is correctly in place, tighten all four green captive screws. 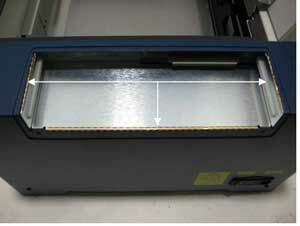 Install the small clamp over the top of the white ribbon cable as shown in picture 17. Reinstall both the left and the right hand side panels on the machine. 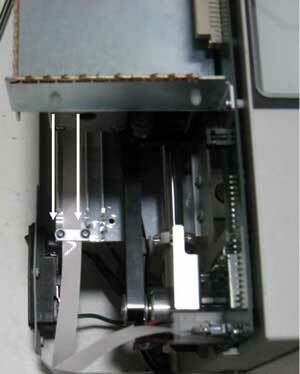 Note around the outside of the control housing (picture 18), on the machines chassis, there are small copper strips with fingers that stick up. These are to shield the control board from electrical interference. Make sure that these copper strips stay in place when you remove the board and when you go to reinstall the board. On the inside of the control housing there are two small grooves that the control board will fit in to shown in picture 19. Ensure that the tabs on the control fit in to these grooves before pushing the control board in to place as shown in picture 20a and 20b. Reconnect the engraver to its power source. 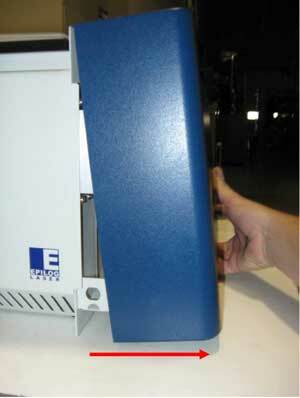 Please perform the Optical Alignment procedure on your Zing engraver to ensure optimal operation of the laser engraver.